Finally, football is back. 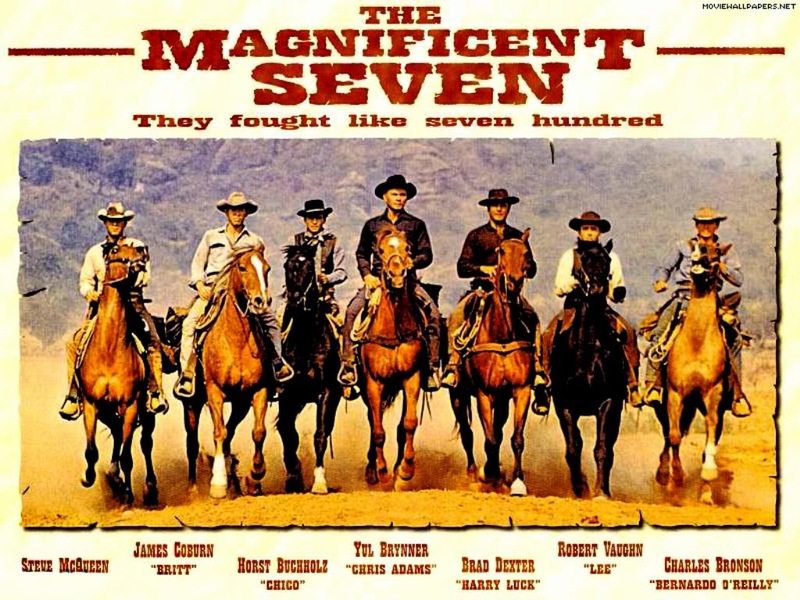 Week Zero served as a nice appetizer, and who knows, if the schedule keeps expanding, perhaps The Magnificent Seven can start appearing a week early. Regardless, the games begin in earnest on Thursday. College football is back, and I couldn't be happier. For new readers, this weekly post will outline the seven games I deem as the best options for you to wager your hard earned money on. If you feel so compelled, send a little of your winnings my way. Let's get to it. As always, home teams in BOLD. In my offseason conference recaps and gambling posts, I occasionally mention The Plexiglas (or is it Plexiglass?) Principle. The conceit behind the principle is simple: teams or players that improve significantly tend to see their performance decline the following season. Why does this phenomenon exist? Basic regression to the mean, opponents getting 'tape' or scouting successful teams more closely, and players performing 'over their heads' (i.e. on the right edge of the bell curve) are all solid explanations. Regardless of the explanation, Purdue is a great candidate to decline, at least on defense, relative to last season. When Jeff Brohm was hired to resurrect the Purdue program, many expected the Boilermakers to see drastic improvement on the offensive end. However, the major reason Purdue went from a 3-9 dumpster fire to a 7-6 bowl winner was the defense. 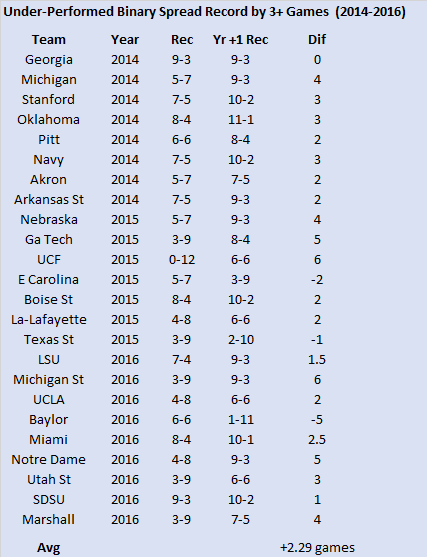 Purdue cut their points per game allowed from over 38 per game in 2016 to under 21 per game in 2017. Their offensive output was basically the same, as they went from scoring just under 25 points per game to just over 25 points per game. The defensive improvement was unexpected and the Boilermakers lose seven starters from that improved unit. I wouldn't expect the Boilermakers to go back to allowing nearly 40 points per game, but the defense should take a step back. Thankfully, the offense should improve in Brohm's second season making another bowl game a distinct possibility. I would be all over Purdue if they were a home dog here, but I think the market has overreacted to Purdue's resurgence last season. Couple that with the fact that Northwestern has been a covering machine as a road underdog of late (six straight covers and a 10-3 ATS mark with eight outright wins since 2014) makes the Wildcats the play in the Big 10 opener. The write up for this pick could easily be one sentence. 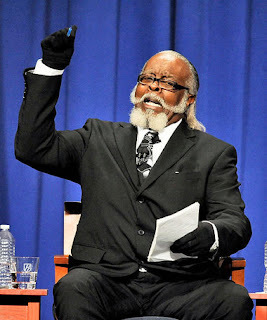 This spread is too damn high! However, since you come to this corner of the internet for enlightened takes, let me give you a few more reasons to back the Chanticleers. South Carolina's largest margin of victory under Will Muschamp is 26 points (and that took three defensive touchdowns). South Carolina has played three Group of Five teams at home under Will Muschamp. They have beaten those teams by five, six, and one point respectively. South Carolina has a pretty big home game coming up on the Saturday after this one. I don't know that the Chanticleers will have the Gamecocks full attention. I have a little bit of data to back that claim up. Since 2005, South Carolina has opened against a mid-major program with Georgia on-deck four times (2005, 2007, 2010, 2011). They won all four of those openers, but only covered once. Coastal Carolina was solid as a road underdog last season. The Chanticleers finished 3-9, but all their wins came in the underdog role. Coastal was 2-1 ATS as a double-digit road underdog, including a near upset of Arkansas, and 3-1-1 ATS as a road underdog overall. Coastal Carolina is getting their coach back. Joe Moglia sat out last season with health issues. The timing could not have been worse, as Coastal was moving up to FBS. Moglia will probably get a little too much credit when Coastal inevitably improves this season (they were 1-5 in one-score games last season), but his return will benefit the team. Reports around Columbia would have you believe the Gamecocks will be embracing tempo this season (with a first time coordinator no less!). Personally, I think they will play with tempo until their first three and out. Then its back to the same ol' Boom Ball. I've been wrong a time or two on this blog, but I don't see how South Carolina covers this large number. This game may not have the national cache of some other SEC non-conference battles on opening weekend, but it could be the most fun. The Rebels have done their best Texas Tech impression the past two seasons, ranking near the top of the SEC in yards per play both seasons, but near the bottom in yards allowed per play. The defense has fallen a long way since the salad days of the Landsharks. Of course, Texas Tech changed their stripes a bit last season, improving to an average Big 12 defense. As I mentioned in the Northwestern/Purdue write up, often dramatic improvement portends a decline the following season. And be sure, the improvement on defense was dramatic. Texas Tech finished last or second to last in the Big 12 in yards allowed per play each season from 2014 to 2016, but improved by more than a whole yard per play and finished fifth in the Big 12 last season. The defense does bring back ten starters, but I still think regression is a solid bet. The defense will need to remain solid, at least early on as the offense must replace the top running back, quarterback, and receiver. The Red Raiders will particularly miss the services of Keke Coutee (a fourth round draft pick of the Houston Texans). Coutee caught 93 passes last season and averaged over 100 receiving yards per game. Speaking of talented receivers, Ole Miss may have the best receiver in all of college football (this side of Buffalo). AJ Brown also averaged over 100 yards per game last season despite a few no shows (in three games against Cal, Alabama, and Arkansas he caught a combined three passes for 54 yards). With another year in Phil Longo's offensive system and with the Ole Miss defense allowing a ton of points, Brown should be primed for a huge season provided he stays healthy. Ole Miss was solid as an underdog away from Oxford last season, going 3-1 ATS with two outright wins. Their lone non-cover came in Tuscaloosa. I think the wrong team is favored here. Take the Rebels to win outright. I try not to overreact to one game, and I know the opposition wasn't the strongest, but based on Wyoming's performance in Week Zero, this could be the best Wyoming team since 1996. There was a reasonable chance their defense would remain strong (second in the Mountain West in yards allowed per play last season), and despite the loss of a first round quarterback, their offense could not get much worse (second to last in the Mountain West in yards per play). 'Workmanlike' would be a perfect descriptor of their offensive performance against New Mexico State. The Cowboys rushed for over 300 yards on nearly 60 carries and while their new quarterback didn't throw a touchdown, he still completed nearly 60% of his passes and didn't turn the ball over. Now the competition ramps up a little as the Cowboys pull off somewhat of a coup in hosting their second Pac-12 team in as many seasons. Their last role as host didn't turn out so well, but things could well be different this time. After posting a Pac-12 record of 19-8 over the past three seasons, Washington State returns just ten starters (by far the fewest of the Mike Leach era). Despite the presence of Leach, Washington State has won a great deal over the past few seasons thanks to their defense which loses their star coordinator. I don't expect Washington State to return to being one of the worst Power Five teams as they were before Mike Leach arrived, but everything about 2018 screams rebuilding year. I think the wrong team is favored here and if you are one of those folks who think history tends to repeat itself pay heed: The last time Washington State entered as a road favorite against a Mountain West opponent, they lost. And finished 3-9. Look for Wyoming to win this one outright. This line opened at about thirteen points and has dropped by a field goal thanks to a few key suspensions the Hawkeyes are dealing with. The lazy handicapper might compare this game to Iowa's opener last year against Wyoming. Iowa came into that game as about a twelve point favorite and despite a lethargic offensive performance, they dominated the Cowboys and their fraudulent first round pick, Josh Allen. Northern Illinois does not have a pro prospect under center. In fact, the Huskies are a far cry from the dominant mid-major offense they were in the early part of the decade with Chandler Harnish and Jordan Lynch leading the team. No, the Huskies win with defense nowadays. Last season, they held six of their thirteen opponents under 20 points and allowed the second fewest yards per play in the MAC. MAC Defensive Player of the Year Sutton Smith finished tied for first nationally in total sacks (14). Smith failed to register a sack in the bowl loss to Duke, but against two other Power Five teams on the schedule (Boston College and Nebraska) he accumulated three sacks and eight and a half tackles for loss. He should be able to cause a little chaos and havoc against the Hawkeyes. Northern Illinois has been a solid play as a road underdog under Rod Carey, going 10-3 ATS including 4-2 ATS as a double-digit underdog. The Huskies have also played well against Power Five opponents, going 5-1 ATS in the regular season with three outright wins. Asking them to win outright might be pushing it, but the Huskies should keep this one close. This line opened with Cal favored by about six points and has climbed above the touchdown threshold thanks to some footwear related suspensions in Chapel Hill. The good news for the Tar Heels is that those suspensions are staggered meaning their depth will not necessarily be obliterated. The Tar Heels will be without presumptive starting quarterback Chazz Surratt, but Nathan Elliott saw significant action last season and should be able to competently guide the team while Surratt is out. Most people, including the betting public, appear to be down on North Carolina, as the preseason consensus has them second to last in the Coastal Division of the ACC. I think that is a bit of an overreaction to an injury-plagued 2017 campaign. Remember, the Tar Heels finished with an unblemished conference record just three seasons ago, and prior to last season had not finished worse than 4-4 in ACC play under Larry Fedora. Cal beat those Tar Heels in Chapel Hill last season on their way to a 5-7 campaign. The Golden Bears saw their defense dramatically improve under rookie head coach Justin Wilcox, but their offense ranked dead last in the Pac-12 in yards per play. With nearly everyone back, the offense should improve, but the Bears were only favored once against FBS competition last season (if Oregon State qualifies), so this role will be somewhat unfamiliar to them. I expect North Carolina to rebound somewhat this season, with 2017 serving as an outlier in Fedora's tenure. If this game occurred at any other point during the season, I think the travel could impact North Carolina. However, with this being the opener, the Heels should have their internal clocks synchronized. If this spread were under a touchdown, I would stay away, but I think the market overreacted in pushing it over seven. Take the Tar Heels to keep this one close. Despite 21 wins in his first two full seasons (the most for the Trojans in consecutive years since the uber-successful Pete Carroll era), Clay Helton is still somewhat of an unknown quantity. His hire was not very creative (you'd think Southern Cal could have done better) and the Trojans spit the bit against the two best teams they played last season. And now they have to replace their leading passer, rusher, and pass catcher from last season (two of the three were NFL draft choices and the third has a chance to make the Titans). There may be some glitches as the Trojans look to get their offense on track and defend their Pac-12 title. The Trojans have been an interesting play as a large home favorite under Helton. In 2016, the Trojans covered each time they were a home favorite of ten or more points (5-0). Last season, they failed to cover each time they were a double-digit home favorite (0-5). And lest you think there were a lot of backdoor covers, the Trojans won three such games by a combined nine points. The typical gambler is always paying a premium to back Southern Cal and I think this spot against an improving UNLV team is no exception. The Rebels have yet to qualify for a bowl game under fourth year head coach Tony Sanchez, but they have improved their win total each season under his tutelage and have gone 6-2 ATS as a double-digit road underdog, including a perfect 3-0 against Power Five opponents. The Rebels won't threaten to win this game, but this number should be closer to 21. I tend to think of myself as being pretty self-aware. I have biases, but I try to write objectively and let data guide my conclusions. That being said, I love the triple-option and I have thoroughly enjoyed the ten years Paul Johnson has been running it at a Power Five program. My affinity for the offense colors my perception of Georgia Tech. Johnson’s tenure at Georgia Tech has seen success (three ACC Championship Game appearances and one title), but also failure (the inability to produce an above-average defense, a non-conference loss to Kansas, and the first two bowl-free seasons in Atlanta since the mid-90s). I’m not here to try to change your mind about Johnson, the option, or Georgia Tech, but I want to share an amazing fact that I discovered while pouring over Johnson’s resume this summer. Excluding the conference championship game (where Georgia Tech is 1-2), the Yellow Jackets are a respectable 46-34 in ACC play under Johnson. 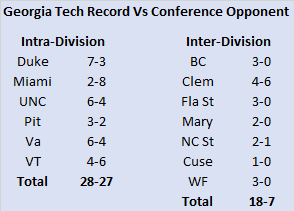 For your convenience, I’ve listed out Johnson’s record against each ACC team below and separated them out as intra or inter-division games. The Yellow Jackets have been perfectly mediocre against their Coastal Division opponents, but they have won over 70% of their conference games against the Atlantic Division! When the ACC split into a pair of divisions beginning with the 2005 season, each school was given a designated ‘rival’ from the other division. Georgia Tech’s designated rival was and remains Clemson. This means the Yellow Jackets and Tigers play each season despite occupying separate divisions. Take a look at what happens when instead of differentiating between intra and inter-division opponents, we look at annual and infrequent conference opponents. Once again, Georgia Tech is decidedly mediocre against ACC teams they play each season. However, their record against infrequent opponents surges to an amazing 14-1! Obviously, fifteen games is a relatively small sample, and with the expansion of the ACC to fourteen teams, the Yellow Jackets only play one infrequent conference opponent each season, but this does make some sense. Outside of the service academies and some downtrodden mid-majors, no other team has an offense like Georgia Tech’s. It would make logical sense that teams that play them on a regular basis would be more familiar with their style of play and better able to defend against it. To test this, let’s look at how many points per game the Yellow Jackets have traditionally scored against both types of teams. We’ll start with their annual ACC opponents. The Yellow Jackets have scored right at about 28 points per game and have scored thirty or more points exactly thirty times in 65 games (about 46% of the time). 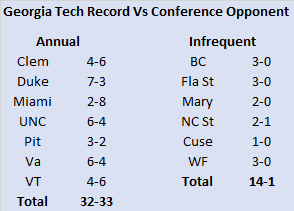 Now, contrast that with how have they done against infrequent ACC opponents. The Yellow Jackets have averaged about five and a half additional points per game against these opponents and have scored thirty or more points 60% of the time. I neglected to include Georgia in the annual opponent table, in the interest of looking at solely ACC teams, but the Dogs' inclusion would serve to bolster my argument. The Yellow Jackets have averaged just 23.6 points per game in their ten games with Georgia, including just 21.2 points per game after scoring 45 in their initial meeting under Johnson. So which ACC Atlantic team (besides Clemson) has the misfortune of facing Georgia Tech this season? Louisville has not faced Georgia Tech since joining the ACC in 2014. They get their turn this season on a short week with a Friday night home game. Georgia Tech will probably enter that game as a decent underdog (maybe a touchdown or so). Both teams play the Saturday before, so neither will have an advantage of additional off days, but the Yellow Jackets have a home scrimmage against Bowling Green while Louisville will be going for their third straight win over Florida State. I think the Yellow Jackets have a great shot at not only covering, but also moving their regular season record against Atlantic Division teams other than Clemson to 15-1. 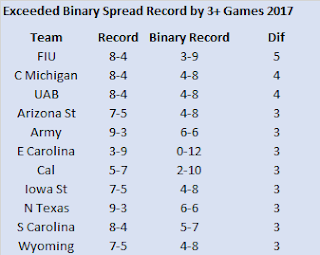 Last week, I discussed a new statistic I dubbed a team’s Binary Spread Record. This simple to calculate measure looks at how many games a team won relative to its expected records based on the betting line. Instead of using a probabilistic look, which is arguably a better choice, I used a quick and easy to calculate measure that only looked at whether or not a team ‘should’ have won their game regardless of if they were favored by two or twenty points. Using this method, I identified a few teams that exceeded their spread record by at least three games in 2017 and were thus a decent bet to see their won total decrease in 2018. This week, I want to look at the opposite. 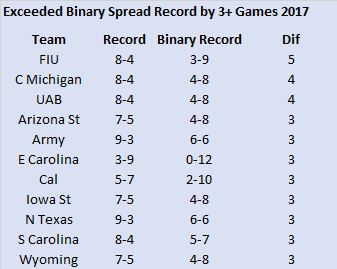 What teams under-performed their Binary Spread Record by at least three games in 2017? 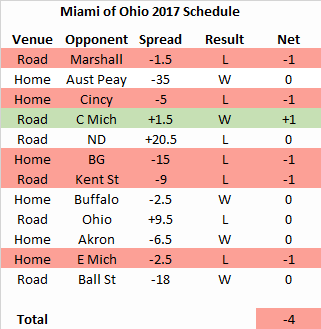 Let’s start by looking at the schedule breakdown of a team that significantly under-performed in 2017: the Miami of Ohio Redhawks. The Redhawks lost five times as a favorite in 2017! 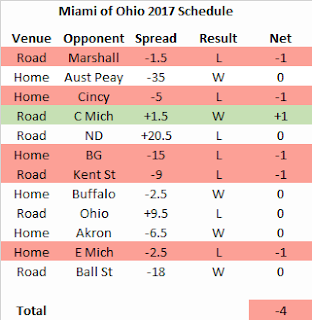 To be fair, several of their losses occurred when they were small favorites (Marshall and Eastern Michigan specifically), but the Redhawks were underdogs in just three games last season. Even with Notre Dame on the schedule, a MAC title and double-digit wins were certainly within reach. Before we access how teams that similarly under-performed like the Redhawks fared the next season, let’s look at another team that failed to meet expectations in 2017, but does not qualify for this list. 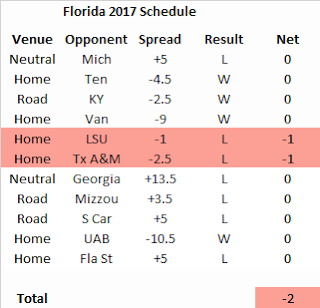 The Florida Gators only missed their binary spread record by two games despite finishing just 4-7. The Gators certainly underachieved, but by the time November rolled around, the betting line had caught up (or down) to them. Vegas knew they were a dumpster fire and reacted accordingly. The Gators were underdogs in their final four games against Power Five competition, and in their lone turn as a favorite after mid-October, they blew out UAB. I looked at every team from the previous three seasons (2014-2016) that under-perfumed relative to their binary spread record by at least three games. I then looked at how much their win total changed the next season. The results are listed below. 83% of the teams that under-performed their Binary Spread Record improved the following season with the average team improving by more than two whole wins! In addition, only three teams saw a decline in their fortunes the following season. So which teams are prime candidates for improvement in 2018? As promised, here is a listing of every team from 2017 that under-performed their binary spread record by at least three games. This doesn’t guarantee improvement, but most of the teams on this list will see their win total improve. One of my favorite topics to discuss on this blog in the betting line. The betting line is a mix of bookmaker ‘power ratings’ adjusted for venue and market corrections based on bets placed that combine to give even the casual fan a decent idea of which team will win a particular football game. But what happens if the betting line continues to make incorrect calls about a certain team? And by incorrect, I mean not just in reference to covering the spread, but actually winning the game. 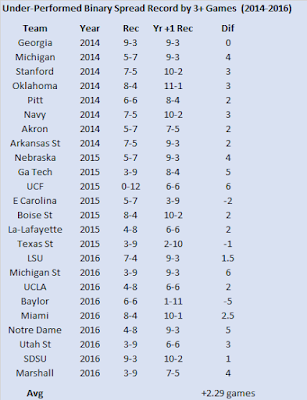 If a team pulls off a lot of upsets or is upset a lot, what tends to happen the next season? Being a resident of Columbia, South Carolina, I have a particular curiosity about teams like this. The hometown Gamecocks, a team I am rather ambivalent about, are getting a decent amount of preseason love by the media and especially the hometown radio station (107.5 The Game). The Game is not quite the propaganda machine of Fox News, but their takes are generally pretty rosy even when the team is struggling. Vegas is more lukewarm toward the Gamecocks’ prospects with an over/under win total of 7.5. Using their surprising performance last season as a frame of reference, what should we realistically expect from the Gamecocks in 2018? 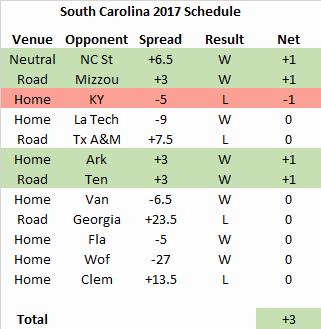 To begin answering that question, let’s review South Carolina’s schedule from 2017. Below I have included their entire 2017 regular season schedule with the venue, opponent, spread, and game result (straight up, not against the spread). The final column (Net) rewards the Gamecocks when their game result differs positively from the spread and penalizes them when their game result differs negatively. 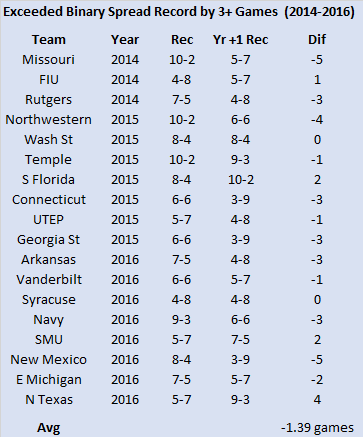 Major thanks to Phil Steele for providing spread data in his annual magazine. 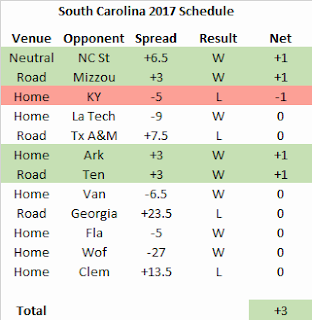 Using the spread as a binary (win or loss) and not probabilistic predictor, the Gamecocks ‘should’ have won five games last season. They won eight. They pulled four outright upsets (NC State, Missouri, Arkansas, and Tennessee) and lost once as a favorite (Kentucky) giving them eight total wins and a net differential of +3. I looked at every team from the previous three seasons (2014-2016) that exceeded their binary spread record by at least three games. I then looked at how much their win total changed the next season. The results are listed below. Eighteen teams met the +3 criteria and two thirds of them (twelve) saw their win total decline the following season with the average team declining by about 1.4 wins. What might be driving these declines? For starters, these teams were probably fortunate to win as many games as they did in what I will dub their ‘upset’ season. If a team wins games as an underdog, but continues to be an underdog in their upcoming games, ‘luck’ could be the driving force in their good record. We’ll define luck or good fortune as being on the good side of more random events like turnovers, huge special teams plays, and general clutch play in tight games. Maybe an analyst would describe it as ‘finding a way to win’. You get the idea. Before we look at all teams that exceeded their binary spread record by at least three games in 2017, I wanted to look at a team that exceeded their preseason expectations significantly, but did not do so by pulling off a lot of upsets. 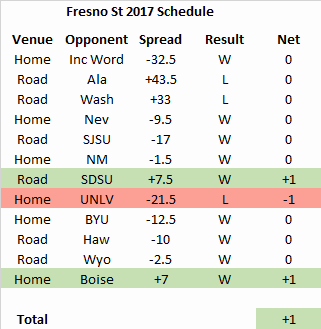 Fresno State finished 1-11 in 2016 with their lone win coming against an FCS team. Despite hiring an established coach in Jeff Tedford, expectations were muted in 2017. Their preseason win total of 4 reflected a small expected bounce, but not much else. However, the Bulldogs surprised nearly everyone by winning nine regular season games and playing in the Mountain West Championship Game. Let’s take a look at how their schedule played out. After an exhibition against Incarnate Word, Fresno was cannon fodder for a pair of elite Power Five programs. Relative to the spread, they performed admirably in those two games and found themselves favored in their first three conference games. After alternating an upset of San Diego State with a head-scratching loss to UNLV, Fresno was chalk until they upset Boise State in the regular season finale. While the Plexiglas Principle certainly to applies to teams that make a seismic leap like Fresno State, they may be more disposed to hold onto their gains than a team like South Carolina since most of their wins did not come at the expense of ‘superior’ teams. As promised, here is a listing of every team from 2017 that exceeded their binary spread record by at least three games. This doesn’t guarantee regression, but keep this in the back of your mind if you plan on backing these teams this season.